This one-day intensive training program is an adaptation of our Supervisory Skills: Advanced Skills four-week training series. Supervisory Skills: Advanced Skills explores the supervisory “soft skills,” including leadership, team building, communication, and conflict resolution. The leadership module focuses on the various leadership styles, including the strengths of each leadership style as well as discusses the traits in each leadership style that derail supervisors from high performance, and the contexts in which each leadership style works best. Participants will take a leadership style assessment to determine which style they fall into. The team building module provides perspective on the diversity of your workforce and how to facilitate engagement of diverse team members on projects. This module includes demonstrations of team building exercises. The communication module focuses on effective communication with and among employees, including the importance of listening for supervisors. Participants will identify their own listening style and review the strengths and weaknesses of each style. This module will also go over communication-related anxiety and ways to reduce anxiety in meetings and presentations. The conflict resolution module focuses on the sources of workplace conflict and conflict handling styles. This module will include practice with communication strategies that have been proven to help resolve conflicts between employees. Send two attendees and get the third attendee free! *Price includes a light continental breakfast, lunch buffet at the Coffee Garden Restaurant, and afternoon snacks. This program is submitted for 8 HR (General) recertification credit hours toward aPHR™, PHR®, PHRca®, SPHR®, GPHR®, PHRi™ and SPHRi™ recertification through HRCI. 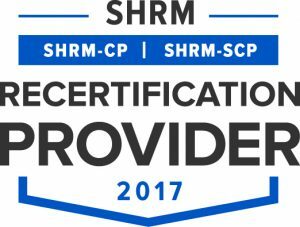 This program is valid for 8 PDCs for the SHRM-CPSM or SHRM-SCPSM.